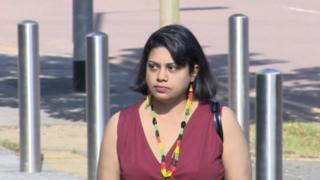 An optometrist has had her conviction quashed after failing to spot an eye condition in an eight-year-old boy who later died. Honey Rose, 35, was found guilty of gross negligence manslaughter after Vincent Barker died in July 2012 when fluid built up on his brain. She was given a two-year suspended sentence in August after missing the condition during a routine eye test. Vincent's family said the appeal court ruling had left them "devastated". Judges found there had been a "serious breach of duty", but that was a matter for regulators and not the courts. During her trial last year mother-of three Ms Rose, from Newham, east London, told the court she had conducted all the required tests during Vincent's eye examination at the Ipswich branch of Boots on 15 February 2012. However, a jury heard she failed to notice that the boy had swollen optic discs, an abnormality which is a symptom of hydrocephalus - fluid on the brain. Vincent, known as Vinnie, died in July 2012, about five months after the eye test. Sir Brian Leveson, sitting with two other judges at The Court of Appeal, said: "This decision does not, in any sense, condone the negligence that the jury must have found to have been established at a high level in relation to the way that Ms Rose examined Vincent and failed to identify the defect which ultimately led to his death. "That serious breach of duty is a matter for her regulator; in the context of this case, however, it does not constitute the crime of gross negligence manslaughter." Image caption The Barker family said a guilty verdict would "never make us winners, our loss is simply too great"
A statement released by the Barker family after Monday's ruling said: "We are understandably devastated. We feel that the conviction of manslaughter by gross negligence should have been upheld. "We remain in no doubt that if Honey Rose had not breached her duty of care to our son he would still be with us today." Not only was Vinnie "let down" by his optometrist, but "he has also been failed by the legal system", they added.